Euclid Police Department keeps statistics on incidents where suspects’ behaviors require officers to respond with force. Since January 1, 2016 Euclid officers have responded to 117,733 calls for service and used force to overcome resistance in 402 of those incidents. This amounts to 1 out of every 292 police interactions that require Euclid officers to respond to resistance. Euclid’s rate of officer use of force incidents is less than 1/3 the national rate as reported by the U.S. Department of Justice. Euclid officers who use force are required to complete a response to resistance form every time they have to use one or more actions of force. 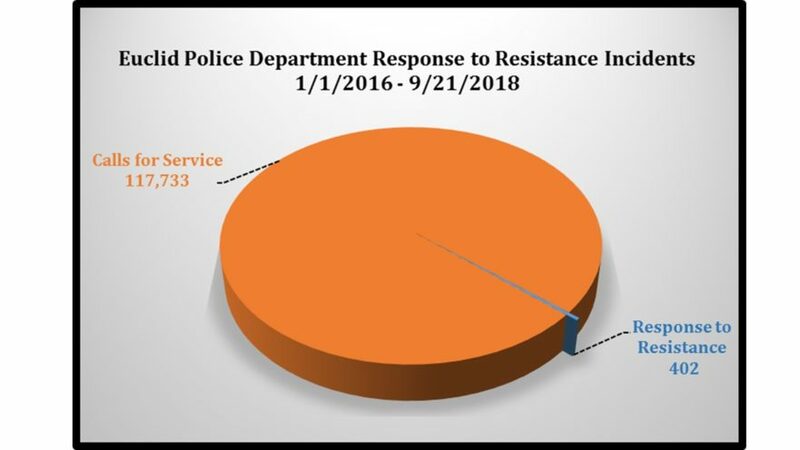 Each response to resistance incident is reviewed by a supervisor to determine if additional investigation is required, and incidents are reviewed monthly by a committee which includes training staff and city attorneys who evaluate for compliance and future training recommendations.